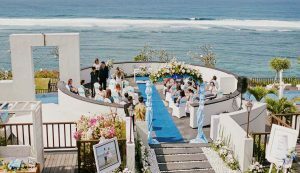 When it comes to planning a wedding in Bali there are a great many details to consider and things to organise. While few Bali weddings are truly unique, you can add many little personal touches to ensure your guests feel like part of the occasion rather than just lookers on. One way to do this is to have a photo booth so that everyone can have fun taking photos of themselves dressed up in the props provided. It may surprise you to realise that at many wedding receptions the guests don’t really feel part of the celebration because the bride and groom haven’t made any special effort to make their reception personal to each one. Without this, the guests tend to feel a bit bored and like they are just there for the food and drinks. If you can take a little time to offer something more personalised to them as well as it being something uniquely from you and your fiancée, then they will feel much more like they have been included because they are your friends and you really wanted them to come. So how can you do this? Here are a few ideas.